OPTi-Sim facilitates a virtual representation of the real DHC system and is a central component of the OPTi framework. It integrates different models in a co-simulation approach. In the OPTi project, OPTi-Sim will be used in the design and verification of new control concepts and optimisation methodologies. Different modelling concepts are evaluated and designed to fit each challenge outlined by the project use cases. This tailoring of models based on use cases is of special interest in DHC systems which usually consists of several thousands of consumers, i.e. simplification is a must in order to achieve enough simulation performance. By structuring the models into different layers, an efficient “plug and play” architecture is obtained that secures usability, scalability and reusability for other DHC networks. 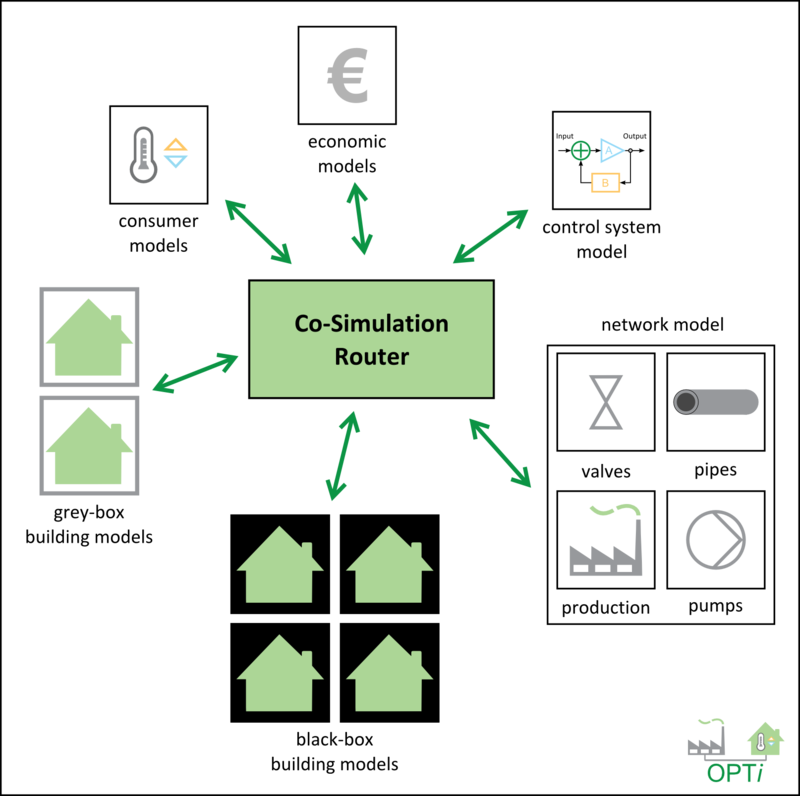 Based on states from the physical model and computations performed in the economic model, the control system model will send optimized commands to the physical model. The physical model, which is automatically derived from GIS data, consists of the DHC network with buildings and consumers. The consumer model reflects aspects of consumer behaviour that are relevant to the DHC system operation, specifically consumer preferences and consumer comfort/discomfort which drives these preferences. OPTi-Sim will be validated on real life pilot cases involving components such as production, distribution, and buildings of a complete DHC system.